On their stand at the recent Offshore Europe exhibition in Aberdeen, NIKKEN Kosakusho Europe Ltd. ran a business card competition raffle challenging visitors to the stand during the show to guess the gripping Torque of the NIKKEN Multilock tool holder on display, write it on the back of their business card and enter it in to a prize draw. 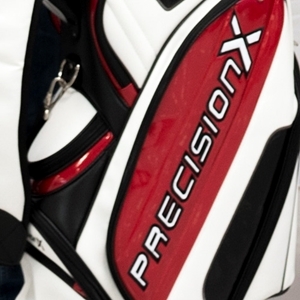 The lucky winner of the top prize, a Precision X Golf bag, was Phil Simpson - Technical Director of Precision Machined Components who guessed the answer correctly and was drawn out of the hat. Phil’s Business Development Director colleague, Shaun Newby, also guessed correctly and was drawn out of the hat to win a dozen Taylor Made golf balls. The challenge posed by the question was to guess “what is the gripping force of a 20mm NIKKEN Multilock tool holder” – the correct answer being an incredible 1,950Nm! 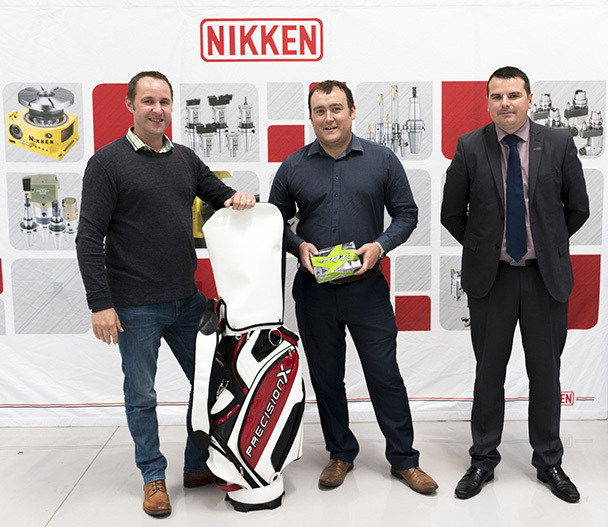 Phil (left) and Shaun (centre) were presented with their prizes by Business Manager Lee Rodgers on 27 September during a visit to NIKKEN Innovation Centre Europe (NICe). For more information on the NIKKEN Multilock Milling chuck click here.